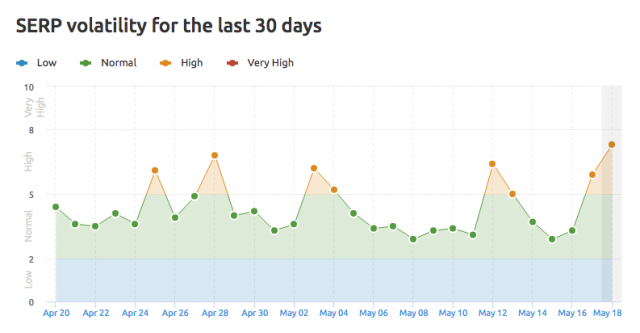 Google Algorithm Update Starting On Wednesday, May 17th? Home > Google News > Google Updates > Was There A Google Algorithm Update Starting On Wednesday? Was There A Google Algorithm Update Starting On Wednesday? 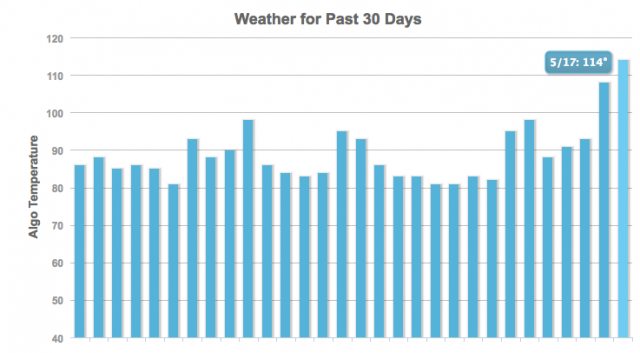 On Wednesday, some webmasters and SEOs began noticing the automated tracking tools from places like Mozcast, SER Metrics, Algoroo, Advanced Web Rankings, Accuranker, Rank Ranger and SEM Rush mostly begin to show significant signs of a large Google algorithm update. Well, what they technically track are changes in the positioning of rankings for the top X thousands of keywords they track. So either the UI changes, which many of these tools try to keep out of their tracking metrics OR the algorithm shifted a bunch of URLs around in the rankings. The issue is, I am NOT seeing massive numbers of webmaster or SEOs complaining in either the white hat or black hat forums. Normally when all these tools light up like this, well not always but normally, you'd see webmasters also complaining about their rankings declining with some also happy that their rankings increased. I am not seeing these complaints in significant levels, so I am scratching my head. I am seeing some chatter, the chatter is higher than normal, but honestly, without all these tools lighting up, I would likely not cover this update. I think the Algorithm Update which have started May 17 - May 18 is still rolling out. Let's Get Ready To Rumble happy! I just looked at my Google Analytics and noticed that all of my major traffic sources were down today by roughly the same amount. Google was down by 15%, but direct was down by 10%, Bing down by 7%, Yahoo by 18%. My Spidey sense is telling me that this was something other than a Google update, unless Google updates also affect other traffic sources. If I compare 17.05 with 10.05 (being the same day in the week) I see a 33.3% drop for impressions and a 2.15% increase for positions. The CTR dropped with 5.23%. Has there been any mention of what the May 17 - 18 Google update targeted? I can't for the life of me figure it out. Some of my pages saw a drop of more than 50% on the 18th, while others either remained the same or saw an increase. The difference between the pages? I couldn't tell you. They're structurally identical, and they all follow the rules. In the good old days, when you got hit by Google, you could just remove an ad and problem solved. These days, there's nothing obvious about it. Nothing you can fix. You're completely helpless. The other forums are somewhat quiet on this but I did see some tweets with complaints as well. But overall, very limited chatter. Maybe it will heat up over the weekend? @pedrodias @dr_pete @mozcast Looks like it'll keep heating up until Saturday/Sunday, before it starts to cool down. Anyway - did you notice ranking changes in Google for yourself or your clients? Let us know in the comments.